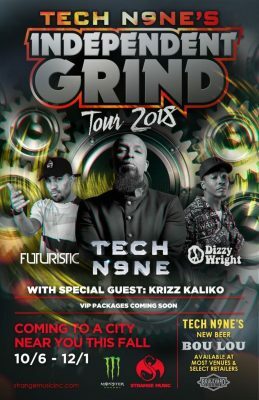 A few days ago, indie rap legend, Tech N9ne, officially announced his Independent Grind Tour 2018 and it’s launching this fall. Sponsored by Monster Energy! The national tour will start conquering venues across America Saturday, October, 6th through Saturday, December, 6th. it will feature fellow indie rappers Dizzy Wright and Futuristic. Of course you can’t have a Strange Music Tour without the emcee genius Krizz Kaliko! That’s right! Krizz Kaliko will also be featured on the 2018 edition of the Indepdent Grind Tour as a special guest! Tech N9ne’s very own brewed beer “Bou Lou” will be available at most venues during the tour. No specific cities announced yet, but stay tuned to https://www.strangemusicinc.com/tours for more info dropping very soon!